The object, a mixed-media collage on a paper support, was overlaid with a grid composed of masking tape and thin paper. Graphite had been heavily applied to the masking tape grid and the paper support. The object was in poor condition due to failure of the adhesive on the masking tape, and the resulting detachment of the grid from the paper support and subsequent reattachment to a sheet of acid-free tissue which had been placed above it in storage. The object had also been mounted to a board using masking tape around the perimeter, which had caused extensive staining on borders of the object. Untitled - recorded as a print in the UCL Art Museum files - is a work by former Slade School of Art student Amanda Ann Ryder (b. 1952). The object was constructed using techniques traditionally thought of as collage, and was produced in the climate of experimentation which was the hallmark of the Slade School of Art printmaking department in the early seventies under artist and head of department Bartolomeu Cid dos Santos. Dos Santos was a former student of the Slade and a widely-exhibited experimental printmaker who encouraged his students to push the accepted boundaries of the medium. The piece discussed in this essay, along with four of Ryder’s other works, were acquired as part of the Slade Prize collection, during a period in the art department which was so relaxed that the tradition of awarding specific prizes was dropped altogether. A look through Ryder’s other pieces in the museum’s collection indicates that she was not afraid to use nontraditional printing materials such as string and pieces of 35mm film in her practice. It appears that she often worked with collagraphy, a printmaking process in which textured materials are applied to the plate. When pressed, these plates form uniquely sculptural intaglio or relief works. Ryder also worked with a spare, minimal palette - mainly in shades of black, white, and gray, with the occasional hint of brown, red, green, or deep purple. Her aesthetic reflects the influence of dos Santos, who made it his life’s work to produce the “deep, profound blacks and beautiful half-tones” also found in Ryder’s printmaking technique. Many of her works were painted or drawn over past the printmaking stage, allowing the artist to introduce spontaneous, freehand elements into the pieces. The end result is a product of the unrestrained mood in the Slade printmaking studio, during an era of experimentation with material and techniques and the swapping of ideas between students, tutors, and departments. Another Ryder piece in the collection has a label on the verso of the mount board indicating that Ryder applied for a scholarship place at the Royal College of Art in the sculpture department, and this serves as a clue to Ryder’s sculptural aesthetic as a printmaker. Her works are strikingly three dimensional in their use of collaged materials, thick, heavy impasto, and geometric forms. Visual examination of the materials used in the construction of the piece suggests that the artist used several layers to construct her images. Assembled in the manner of a collage, the object was created from strips (roughly 3mm to 5mm wide) of masking tape covered in graphite powder, which had been overlaid in a grid-like shape onto a .22mm thick paper support. Very thin white paper fragments were adhered over the top of the masking tape grid using a chine-collé printing technique, in which pressure and a small amount of adhesive allows lighter papers to adhere to heavier supports with a minimal amount of adhesive; this compresses the elements so that they have a flat appearance. Small areas of green media - possibly colored pencil - were applied, followed by an overall shading with a graphite pencil and powder over the top of the entire assembly. The graphite appears dense and metallic on the crepe paper carrier; an attempt to replicate this in the studio suggested that it would have been accomplished by repeated applications with a 6B or 8B graphite pencil. The object was then sprayed with an unknown fixative, as noted in the UCL submission form. At some point during the object’s time in the Slade Prize Collection, a sheet of acid-free tissue was used to cover the top of the collage as protection. However, this had the unwanted effect of causing the tape to become adhered to the tissue in a significant portion of the grid, and to subsequently become detached from the paper support. In addition, the masking tape became warped and over time had shifted its position on the paper support up and to the left, in some places as much as a centimeter. The graphite was also extremely friable. Areas of the primary support where the masking tape was still attached had some skinning, most likely due to tension resulting from the tape’s adherence to the tissue paper above it. Paper patches on the tape grid were creased and torn, and small fragments of paper, which had been ripped from the primary support, remained stuck. A significant body of research exists on the composition and deterioration of pressure-sensitive tape. In the case of Untitled (1973), masking tape was used for the construction of the collage as well as for mounting the object. As masking tape ages, the tackifier resin migrates up into the crepe paper carrier. This is due to similar solubility parameters between the adhesive and the elastomer, a substance impregnated in the carrier during the manufacturing process to increase its strength and flexibility. As a result, the grid adhered itself to the tissue which was pressed on top of it; the fixative applied to the graphite may have also contributed to this phenomenon. Fortunately, the tape’s detachment from the paper support seemed to have left the area free of any adhesive residue, and the artist’s graphite markings served as a guide to the original placement of the tape grid. Due to the fragility of the masking tape grid, the first step would be to remove it completely from areas where it was still adhered to the paper support. This would leave it it attached to the tissue paper, which would later serve as a temporary support system for moving and treating the grid. Once this was safely out of the way, the paper support needed to be removed from the now-unsuitable mount. The adhesive would need to be removed and any associated staining reduced. In order to test appropriate adhesive systems for re-attaching the masking tape grid to the paper support, a mock-up needed to be constructed. At first the intention was to age newly-purchased masking tape in an accelerated aging oven, however a discovery during research suggested a more effective solution: using naturally aged masking tape of approximately the same age. As handwriting on the mount was found to be identical to writing in the original Slade Prize submission log, this indicated that the mounts were contemporary to the print and were most likely applied by the artist. This suggested that the masking tape used for mounting was likely to be roughly the same age as the masking tape grid, and possibly of the same brand and formulation. Therefore, once the aged tape was removed from the mount, it was saved in order to test re-attachment systems on a paper of similar thickness. Once a suitable adhesive was found, the tape grid would be released from the tracing paper, lightly humidified and pressed, and a new adhesive system would be put in place to readhere it to the original paper support. Small tears would be mended on the verso of the object, and once fully treated it was to be remounted using stable, museum-grade materials. The tape grid was still adhered to the paper support in the left-hand corners of the recto, and a scalpel blade dipped in acetone and manipulated beneath the crepe paper carrier allowed the corners of the grid to be removed without harming the paper support. The top of the carrier was still adhered to the sheet of tissue which had been placed on it in storage, and this was able to be removed mechanically with a microspatula without needing to apply solvents. In order to test adhesive systems for re-attaching the tape grid, a mock-up had to be created which would allow samples to be made and compared. 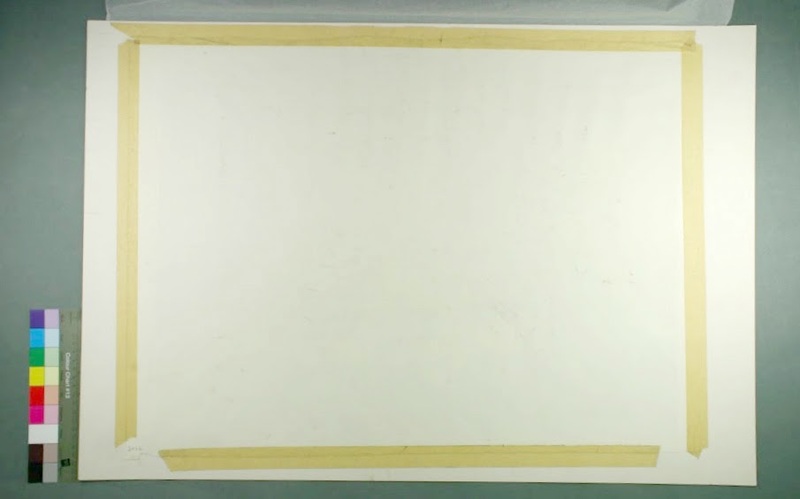 A template was created by tracing the bottom right corner of the tape grid onto tracing paper, and then trimming strips of the masking tape which had been removed from the mount. Once the two facsimiles were created, the adhesive was removed from the back with toluene to mimic the low adherence of the original grid. Cellulose powder was then dusted over the crepe paper carriers to ensure a non-sticky surface. A graphite pencil (Faber-Castell 6B) and graphite powder were applied to the paper carrier and smudged with a cotton swab so that the tape was thoroughly covered with graphite particles. Snowdon 130g cartridge drawing paper (which had a similar texture, thickness, and colour to the original support paper) was chosen as the test support. The requirements for an adhesive to re-adhere the tape grid were the following: 1) that it was solvent-, heat-, or pressure-activated, in order to aid readherence in situ, 2) that it was easily reversible, 3) that it allowed for the repositioning the grid before setting, and 4) that it was stable. After researching a number of adhesive types and case studies, the decision was narrowed down to testing two types of adhesive: Lascaux 360 HV (currently sold as 303 HV, water dispersion of butyl methacrylate copolymer and thickened with butyl polyacrylate) used as a double-sided pressure-sensitive adhesive, and BEVA 371 film (Ethylene vinyl acetate copolymers, cyclohexanone resins, phthalate ester of hydroabietyl alcohol and paraffin) used as a heat-set adhesive. In a previous case study, BEVA 371 film had successfully been used to readhere failing cellotape carriers on a Rauschenberg diptych. Conservators at Tate Modern in London had also used it to reattach masking tape to a Francis Alÿs installation and to preserve brown packing tape on objects in a Thomas Hirschhorn exhibition. Pressure-sensitive tape composed of Lascaux 360 HV and Japanese tissue had been documented for use in assembling segments of a large map for exhibition. It also rated highly for reversibility and showed very little skinning, adhesive residue, and text loss in the Canadian Conservation Institute’s Adhesive Tape and Heat-Set Tissues Project. Lascaux 360 HV pressure-sensitive tape was prepared by brushing the acrylic dispersion onto a sheet of mylar in a thin layer, placing a sheet of humidified Japanese tissue above it, and then spreading a second layer of the adhesive. The tissue needed to be thin enough to work as a piece of double-sided pressure-sensitive tape, as well as strong enough to hold the masking tape grid onto the paper support and avoid tearing during application. After the two samples were prepared, they were left to cure overnight in a fume cupboard to discourage dust. They were subsequently covered with another sheet of mylar, and then cut into strips roughly 4mm wide. The mock-ups were prepared by humidifying them in a small Sympatex chamber for 45 minutes. After pressing them they were applied to Snowdon 130 gsm cartridge paper. Strips of the pressure-sensitive tape were applied in one-inch sections to the underside of the mock-up and then gently reinforced. BEVA 371 film was applied with a tacking iron and a sheet of silicon release paper; it was noted that the heat of application caused significant movement of the graphite particles onto the silicone release paper. Once the mock-ups were successfully applied to the cartridge paper they were dusted with graphite powder to approximate the artist’s finishing technique. They were then aged in a Gallenkamp 300 Plus forced-convection oven at 104 ⁰C for five days in order to test long-term stability of the adhesives (roughly the equivalent of aging the paper 42 years, though by no means an exact measurement). Once the test samples were removed from the oven, they were examined in order to detect the presence of any changes. The sample made with BEVA 371 film showed the most dramatic difference, with yellow staining appearing on the verso of the paper support in the areas it had been applied. In addition, the tape grid also showed poor adhesion to the support. This, coupled with the fact that the heated application caused the displacement of graphite particles, indicated that BEVA 371 film would be an unsatisfactory choice of adhesive. In contrast, the sample with Lascaux 360 HV showed no staining or discolouration, and the object still had good adhesion between the tape grid and the support. The decision was made to “re-tape” the object with Usimino 16 gsm and Lascaux 360 HV as it most closely mimicked the adhesive effect that the original masking tape grid would have had, and allowed for adjustments in application; the tape could be moved if the original placement wasn’t satisfactory before pressure was applied. In addition, this method would be quicker than using a solvent-activated remoistenable adhesive tissue, but was fully reversible in acetone and toluene, should it need alteration in the future. Due to tension on the crepe paper from its adherence to the tissue paper, the tape grid was creased in several areas. Some pieces had folded in on themselves, and the very thin paper which had been applied with the chine-collé technique had ripped in places and become wrinkled. In order for the piece to regain its original, flat appearance (or as close as was possible without putting strain on the tape or support), the tape grid needed to be humidified. Spot tests of the media showed that it was extremely moisture-sensitive, so a combination of a humidification tent (with Sympatex) and the use of an ultrasonic humidifier were tested. The ultrasonic humidifier proved to be the most effective in terms of encouraging the tape grid to flatten in precise locations. The thin tissue patches on the tape grid were torn and creased in many areas, and needed to be stabilised before the entire grid could be replaced. After testing the tissue and media for moisture sensitivity, the torn and creased areas were locally lined or repaired with Tengujo Japanese tissue (11 gsm) and wheat starch paste (30% w/v). The entire grid was then left to press overnight. Once prepared for reattachment, the grid was placed on top of the original support and aligned as closely as possible. Due to the tape grid warping and expanding, it would not line up completely with its original location on the primary support. This left white areas where the grid had originally been anchored. It was felt that to attempt complete coverage by stretching the tape grid would cause tension on the object. Therefore, aligning the paper patches (where pencil lines needed to register exactly) became the priority. Small, 4mm-wide pieces of Lascaux 360 HV were cut for the double-sided pressure sensitive Usimino tape which had previously been prepared. These were inserted under the joints of the tape grid as each section was gently pressed into place. The pressure-sensitive tape allowed for some adjustment of the object during its placement, which was a welcome feature when aligning the tape grid. Application proceeded from the lower left-hand corner up to the upper right-hand corner. The object (tape grid and support) was then gently pressed overnight to ensure even adhesion of the grid. Wheat starch paste (20% w/v) was applied to the thin paper patches in order to flatten and secure them to the support, and to readhere tiny areas of skinning which had been caused by the tape grid’s tension on the paper support. Areas of the tape grid which were too delicate for the double-sided pressure-sensitive adhesive were also gently pasted down, and the object was pressed a final time overnight. Treatments to conserve Amanda Ryder’s Untitled (1973) successfully stabilized the degraded collage elements. The masking tape grid and primary paper support were able to be reunited without sacrificing the integrity of either part of the object. Double-sided pressure-sensitive tape composed of Japanese tissue and Lascaux 360 HV served as a gentle way to re-adhere the masking tape grid without applying tension. It also allowed the object to be repositioned during treatment without the use of solvents or heat.